Just to let you know I'm going to cease posting to this blog. Given that Clara and I are abou to leave Australia, and hence Rabbi Don won't be in Oz much longer, I am starting a new weblog. You can find it at jewishhorizons.blogspot.com. I hope you enjoy continuing to read my thoughts as we enter into a new period of transition. Thanks! So, just as all good things must come to an end, so too this year’s Counting of the Omer. Whilst I’ve enjoyed offering a new thought every day during this period, I have to admit I’m happy it’s coming to an end. Writing something substantial every day is a bit draining! Maybe I should take a lesson from Twitter and limit myself to 140 characters! No, I don’t see that happening; I just don’t think in bytes of 140 characters! I’ve used this, the last week of the Counting, to go over the principles articulated by Dr. Stephen R Covey in his blockbuster book, The Seven Habits of Highly Effective People. When I read this book, and took the course that expands upon it, I found these principles to be nothing short of life-changing. But the most incredible things is that we already ‘know’ virtually all the Habits, at least superficially, because Covey’s nomenclature has so permeated our culture, and the words and phrases he coined have become standard English. In offering the principles as daily thoughts, it is not my intention to give you a ‘Cliff Notes’ version of Covey’s book. Rather, my purpose is to whet your appetite to buy and read the book if you haven’t yet, or re-visit it if you read it sometime ago. I am so convinced of the need to re-visit The Seven Habits, that I keep it on my Kindle e-reading device and yes, I do refer to it fairly often. Does this mean that I succeed in living out The Seven Habits constantly, 24/7/365? Negative, and that leads me to some feedback I received yesterday. I am grateful for the feedback I’ve received from you during this time of offering daily thoughts. Firstly, because it tells me that someone is actually reading them! And secondly, because it tells me that you are engaging with the material. Some of your feedback has taken me to task for something I wrote. That’s okay, because you were nice enough about it! But it reminds me of what a colleague, Rabbi Mel Glazer in Colorado Springs, tells members of his congregation when they tell him that they disagree with something of other that he has said or written. I’m not speaking for you, he would tell them. I’m speaking to you. I’ve learnt so much of importance from my esteemed colleagues, and from those whom I’ve served in the rabbinate, over the years – and this has to be one of the all-time best gems of wisdom. If you think a Rabbi is attempting to speak for you, which is understandable because after all, an unofficial function of the Rabbi is to serve as a sort of mouth-piece for the Jewish community to the greater world, you might take offense at something the Rabbi said or wrote because you disagreed with it. But when you understand that he is speaking to you, it changes the calculus considerably. The feedback I received yesterday was from someone who has been reading my daily thoughts, and sometimes reacting to them in an e-mail. As I prepare to wind up the series, she offered her sincere apologies for not living up to the principles I’ve been writing about. I explained to her in private, and now I’m going to repeat in public: Any behavioral habits that I advocate in these thoughts are not be taken as prescriptive. That’s why I’ve offered so many anecdotes telling you about instances where I have not lived up to the principles I’m advocating. It’s not because I like writing about myself so much! (Okay, maybe in part…) Really, I’m trying to illustrate to you that even simple principles are difficult to live out constantly! So when I offer these thoughts, I’m not trying to show you how messed-up you are. Rather, I’m offering an aspirational view for you to consider and, if you agree with what I’m saying, which might help you in your efforts to be happier, to be more effective, whatever. Please don’t read my thoughts, see yourself as falling short, and thinking poorly of yourself for that! I only want to uplift you! So we’ve gone through six of the Seven Habits. The first three dealt with the private person, or as Covey put it, achieving private victory. They are: Be Proactive, Begin with the End in Mind, and Put First Things First. It’s easy to see these as organising principles, but they are really much more. They have to do with taking your Corre Values and adjusting the way that you operate in every sphere to help you to live them out. The next three Habits dealt with the public person, or as Covey put it achieving public victory. They are: Think Win-win, Seek to Understand, then to be Understood, and Synergize. These three Habits help in those areas of life where we are interdependent with others. In other words, in just about every area of life. The final Habit is really appropriate to highlight as we prepare for the weekly Sabbath. It is: Sharpen the saw. Covey challenged us to see our bodies and minds as tools that we use to accomplish. And just like any tool, these need to be maintained in order to continue to get the job done. One uses a saw for cutting things. And as you use it, the blade becomes dulled. When that happens, if you continue using it you will find it works less and less efficiently. Does that mean that we discard a dull saw? Of course not; we take it to a specialist, who sharpens it for us. In the same way, the ‘saw’ of our bodies, minds…also of our initiative, must be ‘sharpened’ from time to time. That’s why we take days off from our work, whatever it is, relax, and engage in recreational activities of our own choice. That’s why we make time to work-out in the gym, or take a run/walk/bike ride, go for a swim of sail, play a round of golf, a set of tennis – whatever activities we particularly enjoy. Doing so, leaves us refreshed and ready to tackle the next challenges in our work. If we don’t take time off, and do these wort of things to refresh ourselves, we find ourselves becoming progressively less effective. So doing so is not self-indulgent in any way: it is necessary, as necessary as eating well and getting a good night’s sleep. G-d, through the Torah, offers a way to Sharpen the Saw that has surely stood the test of time – and that is, the weekly Sabbath. The Torah specifies the Sabbath of rest as being on the seventh day, which begins with sunset today. This aspect is only considered binding upon Jews. Some – most – Christians have made Sunday into their day of rest, since that is the day of the week when their saviour arose from the dead according to their scriptures. Our Muslim cousins make their special day on Friday. And that’s fine – they are still, in principle, taking one day in seven to refresh themselves and their faith. Of course it would be more convenient for us Jews, if everybody else would adopt the same day we mark as the Sabbath! 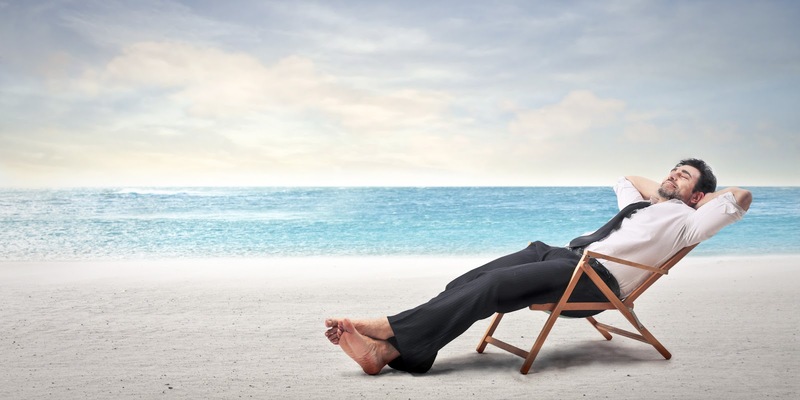 But otherwise, it’s simply important that all take their day of rest from their industrious and creative work, and take the time to contemplate, consider, rest and enjoy. If we are not careful to ensure that we have enough opportunity to recreate, all the six aforementioned Habits won’t make us effective. We’ll burn ourselves out for sure. So Sharpen the Saw is important, because it is the key to everything. And now I sign off from the daily thoughts. I wish you a restful Shabbat, and a joyous Shavuot. And I will be back next Shabbat with the weekly thoughts! Here it is, Thursday night. Since you know there are only two more evenings – this and tomorrow’s – before Shavu’ot, you know that we’re on the Home Stretch here. In the Seven Habits of Highly Effective People we’ve reached the sixth Habit, the third of the three that have to do with being effective in interdependence. So the Habit for today is: Synergize. I know you’ve noticed, that this Habits all sound familiar. That’s because these words and phrases, coined by Dr. Covey, have entered into popular consciousness. Covey’s Habits have, in effect, become part of our culture. Today’s Habit is no exception. 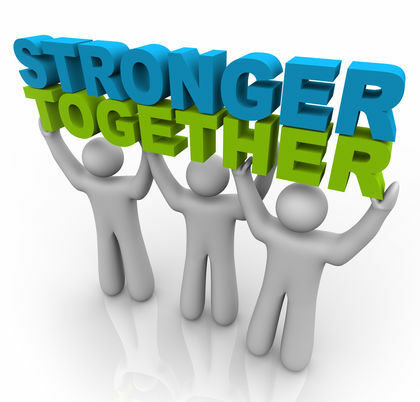 Synergize is a term that most of us know, and most of us know what it means. It means that, by combining together, we equal more than we do collectively as individuals. To put it differently, the total is greater than the sum of it parts. In maths, two plus two always equals four. But what synergize teaches us, is that in human capital two plus two could effectively equal five. The reason is that, when we pool our talents to complement one another, we in effect make each member of the team stronger and more effective. Although this concept seems to break the laws of mathematics, most of us see the deep truth in it. I don’t know about you, but I can usually find reasons to forget trying to work together with others and go it alone. No matter how hard we work to build a team, at the end of the day it is comprise of individuals who, in addition to their strengths, all have their quirks and challenges. It is always tempting to take your own talents, make the most of them, and don’t worry about motivating and working with others. But we must. Because however many times others have disappointed me, I’ve probably disappointed others as much. It’s simply a fact of life. Because we’re all imperfect, subject to mood swings, errors of judgement, and muddled thinking. So even when I think I’m avoiding others’ quirks by working on my own, what I’m really doing is operating in a bubble where I am not availing myself of others’ perspective. The Habit synergize applies to teams at work. In clubs and organisations. In religious life. In marriage and other interpersonal relationships. It’s really universal. This Habit – like all the Habits – can help you whatever your walk in life. They are universal, like few things in life are. Tonight we continue with the Seven Habits of Highly Effective People. While the Seven Habits are not coined in specifically Jewish terms, when I was exposed to them I as a Jew found that they resonated deeply with me. The book, by Dr. Stephen R Covey, provides a simple and do-able process for living a life in concert with the values that you have identified as your own. That’s what this is about at its core: tools to enable you to live out your values, rather than being constantly tossed around on the sea of contingencies. Tonight’s Habit is: Seek to understand…then to be understood. Everybody wants to be understood. We crave understanding from those around us. Out of our need to be understood, we can busy ourselves night and day, explaining ourselves to everybody who will listen. And therein lies the problem. Most of us are so intent on being understood, of having people hear us, that we forget to listen to others. How many times have you tried to explain something to someone else, and felt that they weren’t really listening to you? That instead, something that you said had triggered in them thought about themselves and their own concerns? I’m guessing that you have. And I’m also guessing that you have been that other person, not hearing what someone else was saying because you were thinking about yourself. If so, you’re in good company! It is such a common pitfall, that when someone can transcend it and really focus on what someone else is saying, that person is really exceptional. Try it! When someone is ‘bending your ear’ about something important to him or her, try to focus completely on what they’re saying, but even more so on the person’s underlying concerns. Focus your energy on giving them empathy. Just for once, try to forget that you exist, excep as a sounding board for that person’s concerns. Try very hard to take in, and understand them. Don’t worry a bit about it they understand you. The ability to focus on someone else is such a rare ability, that it won’t go unnoticed. And if you are able to do it, you will be able to touch someone else as you never have before. And chances are, that person will later be committed to addressing your concerns. I’ve found that, in community building, one of the toughest challenges is to help people transition from the ‘what’s in it for me’ mindset to a ‘let’s see what we can do for you’ attitude. But in order to build real community, it is necessary to bring a group of people to that point, where their regard and concern for others replaces the complete focus on their own needs. I’ve found that if one or two people in the community can model this quality, it becomes infectious. 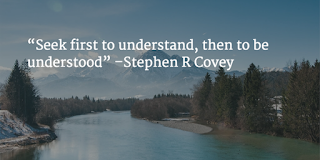 Try to understand before You try to be Understood is an important tool in that transition. The first three of the Seven Habits of Highly Effective People, which I presented to you over the last three days, are intended to help you achieve independence. We can overcome the negative habits that we’ve built up over a lifetime, and replace them with the positive habits Be Proactive, Begin with the End in Mind, and Put First things First. If we can adopt these three habits, we can begin to take control of our lives and feel far less as if we’re caught in a relentlessly-rushing stream of helplessness from which we cannot extract ourselves. Starting tonight, I’d like to present Habits four through six, which are geared toward developing interdependence. Very few are the endeavours in life that one can enter into and accomplish without working successfully with others. We are social animals, and we need to have others in our lives. It is fine – and actually, quite healthy for most of us – to seek solitude from time to time. I’m an introvert, and people of this personality type need solitude to recharge after they’ve been drained by being around others. But to creat a life where one is absolutely independent is not good or healthy. Tonight’s Habit is: Think win-win. 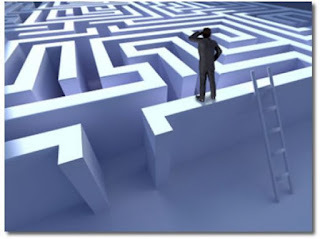 When trying to settle on a course of action that involves others, it is normal that different members of the group find themselves being pulled in different directions. There are sometimes situations where the various choices are mutually exclusive. But in most situations, it is possible to find a way where the various parties get satisfaction. The mindset of trying to find such solutions, is called win-win. 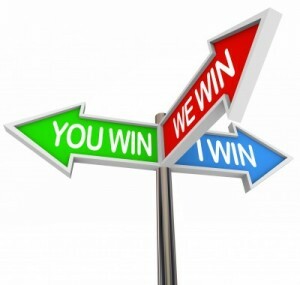 There is a mindset that in every disagreement one side must win and the other must lose. This is a result of a mindset that is called ‘zero-sum thinking.’ It is a common pitfall. In most cases, a mindset of Win-win will find a way that all parties can get at least part of what they seek. And if the effort is made, they can realise the most important elements. Zero-sum thinking says that everything I gain, is at someone else’s expense. In other words, in any situation there are a fixed amount of resources – whether money, time, human capital, whatever – and the pie that can be sliced between competing interests is of a fixed size. An example of Zero-sum thinking is in economics. Say I succeed wildly in business and make a lot of money. There’s nobody who should think that I’ve made my money at their expense. There is not a constant supply of money in the economy; it is fluid and increases as people produce goods and services that others wish to purchase. So, expect perhaps for those producing and selling a product that directly competes with mine, nobody should think that I, in making a large amount of money, have prevented someone else from doing so. Usually the opposite is true: when one person makes money, he spends it on other peoples’ good and services and creates wealth to build a demand for things in the marketplace. But there are many people who have a Zero-sum mindset; if I earn a million dollars (halvai! ), they think that’s a million less for other people to earn. But economics simply doesn’t work like that. People adopt Zero-sum thinking to just about every area of life. Think Win-win is its antithesis. Think Win-win is a mindset that starts on the assumption that there are enough resources to fulfil everybody’s needs. The challenge is, within the framework of a group and its efforts, to find a way to make it so. Think Win-win says that there is enough for everybody, we just need to have a broad enough vision to find a way to achieve enough as a group to satisfy everyone. Think Win-win is a patently optimistic way of looking at life. It starts from a assumption that satisfying everyone is desirable, and possible. The person who Thinks Win-win will never be a ‘cheapskate’; he will always be generous with others, because he knows that whatever he has, he can always get more. It’s just a matter of finding the way. There are limits times when Zero-sum is a reality. For example, in an election for a specific office: several candidates are running, but only one wins. On the other hand, the winner might coopt the talents of his opponent(s) by offering a position in his administration. It is a common consequence. Look, the loser didn't get the office they sought but they didn't necessarily have to be vanquished from public life. In this sesne, even competitions that are superficially Zero-sum can be turned into Win-win situations. As I said, it's all in the mindset. First of all, I’ll wish you a Chodesh Tov, a good month. With the setting of the sun today, Rosh Chodesh Sivan has begun. The third of the Seven Habits of Highly Effective People, is Put first things first. Every day when I wake up to begin a new day, I have in mind a list of things I wish to accomplish that day. Now the aggregate of time required to accomplish these tasks never amounts to the amount of time I have available. It hasn’t always been so. There have been times when my life was far more hectic than it is now. But my task-load nowadays is – well, let’s call it ‘manageable.’ That said, by the end of the day I haven’t always gotten through all the tasks I had assigned myself to accomplish that day. There are a number of reasons for this. Sometimes things just come up, and I assign to them a priority higher than that of the items on my task-list. Sometimes they are true emergencies, and sometimes just things that are more critical to me or to someone else. For example, if someone rings and just wants to talk, I usually won’t stop them – unless I absolutely have to go somewhere or get something done by a certain time. I try to make time liberally for others who come to me as a Rabbi or as a friend. But sometimes, I’ll end the day without having accomplished my list of tasks, and in truth nothing came up during the day that trumped the items on my list in importance. What happened was that allowed myself to get sidetracked into spending time on something that simply did not matter. If this was a few years back, I would offer as an example of a likely culprit, e-mail. One of the first things I would do when I started my work day, was to open my e-mail and look at all the new messages. But the truth is, almost every message comes with a subject line that gives the recipient a general idea of what’s in it. Between the subject line and the identity of the sender, it is easy to make a judgement call as to how high a priority to assign to an e-mail. And even if now, one can open it and read it quickly, and decide whether it warrants any quick action. But the truth is that, even if it did not, I would usually set myself to responding to it immediately. E-mail is so, as the kids say, last decade. Today, the first example of a time-waster that comes to mind, if going through my news feed on Facebook. Don’t get me wrong, I think Facebook is a wonderful tool for communication – you may be reading this blog post because I posted a link to it on Facebook. But if I took time to read everything that all my ‘friends’ posted, I would never get anything else done! This is an example of not putting first things first. I started my day with a list of task that were important for me to accomplish, yet I would allow myself to be easily sidetracked responding to an e-mail…even if it was clearly not very important. I would even open, and read, and even sometimes forward e-mails with jokes or funny stories, when I had a list of yet-to-be-accomplished tasks. If that’s how I prioritised my work, how could I blame anybody else when I did not accomplish what I had set out to do? Of course – nobody. Nobody but myself. It is all too human to allow oneself to get sidetracked like this. Maybe the tasks at the top of your list are not especially pleasant tasks. Maybe they are things that are difficult to do. So you put them off, usually without much thought, burying yourself in little niceties that come up. Because, at the heart of the matter, we don’t really want to do the tasks that we really need to do. I’ll never forget when I was in the Navy and was a watch chief with 11 people in my watch. I had the task of writing, and presenting, quarterly feedback to each member of my team. There was one member, a guy I really liked, but I had to give him feedback that was going to challenge him. At least, I had to if I was going to accomplish the task with integrity. So I wrote the counselling paper up, along with all the others, and I spent a good part of a watch sitting behind a closed door, counselling each person in turn about his performance. The man in question, I saved for last. When we sat down together, we began chatting and were talking – just about stuff – for some minutes. Finally, he realised I was stalling; he pointed at the paper sitting on the table in front of me and asked me point blank: Is it that bad? No, it wasn’t that bad, but I’d been avoiding a task that I expected would not be especially pleasant. 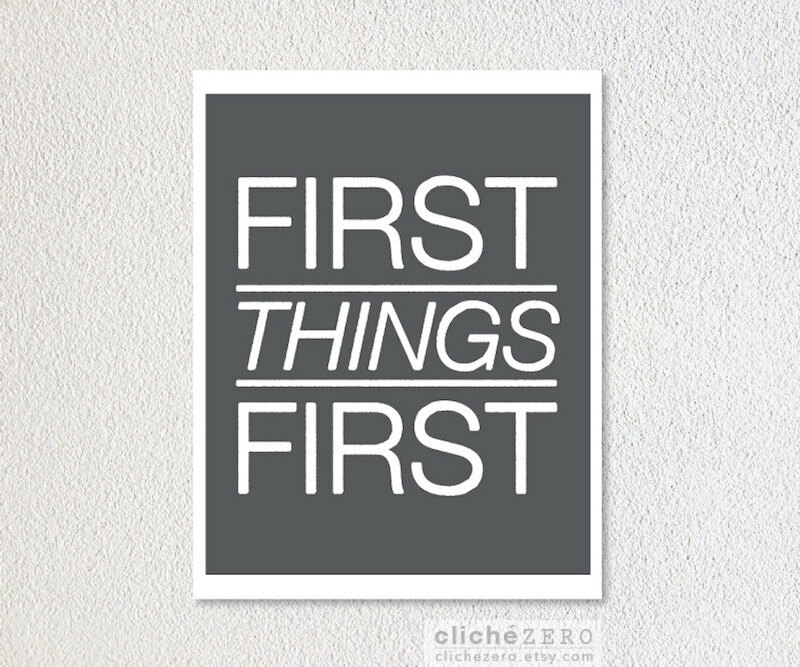 I was not Putting First Things First. There is an old technique for knocking off a long to-do list. Say, there are ten items on the list. You take the easiest tasks, those which you can accomplish the quickest and with the least sweat, first. In doing so, you cut the list down quickly: from ten items to nine, then to eight, and so on. By checking off items, you feel the psychological weight of the long list of unaccomplished tasks, lessen. This is a perfectly legitimate technique, and I do it often, and it’s not what I’m talking about here. Rather, I’m talking about how we sidetrack ourselves with time-wasting activities that are not going to lessen our to-do list at all. 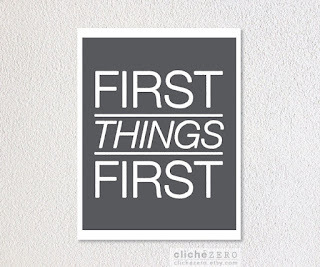 If we learn to Put First Things First, we will see how much more effective we will be. Try it! We’re in the seventh and last week of Counting the Omer, and the last week of my offering daily thoughts. Therefore, as I wrote yesterday, I’m going to use these days by going back to one of my favourite themes: one which, since I learned it and adopted it in my own life, has been nothing short of life-changing in a very positive way. And that is, The Seven Habits of Highly Effective People by the late Dr. Stephen Covey. From the title, and given the way that the literary world classifies it, one might think that Seven Habits is just another business, or self-help book. To be sure it is both, but it is much, much more. It is nothing short of a way of life, a way of looking at the things that we do – whatever our life’s endeavour – and making ourselves more effective by providing a structure within which we can inject our own core values into what we do. The Seven Habits are intended to help us make systematic that which we cling to on a philosophical level. As I wrote yesterday, my intent is not that this series of brief thoughts on the Habits would substitute for reading the book. Rather, my prayer is that it would spur you to buy and read the book if you haven’t already. And if you already have read it, that my thoughts would provide a little refresher to help you to re-centre your life around the Habits. I am so completely sold on The Seven Habits, that I dedicated an entire High Holy Days Sermon Series to them. If you’re interested, you can read them on this blog by looking in the archives for September 2013. The Second Habit is Begin with the End in Mind. Look, this Habit, like all the Habits, is not, as they say, ‘Rocket Science.’ The elegance of The Seven Habits is in their simplicity, the ease with which even I can look at them and ask, Why haven’t I been doing this all my life? But the truth is that most of us have not being doing these things all our lives – not because they aren’t absolutely intuitive, rather because we allow ourselves to get sidestepped, our attentions diverted to other matters. And that certainly would include this Second Habit. How much energy have you wasted in your life, but just diving into a project without taking some time to visualise its final form, its outcome? I know that I have, so I’m assuming you have also. We fail to achieve our goals for a variety of reasons. Sometimes, but less often than we claim, they were just beyond our reasonable capability. Sometimes, we really had no strong commitment to the goal and therefore didn’t give it our all. There are other possible reasons. All of us have failed in something, and it is not a shame to fail. Even the most successful people often fail at one endeavour or another. But one reason, which is often to blame and which we can control far more easier than most, is that we spent time and energy flailing about rather than thinking out a plan and putting it into effect. Begin with the End in Mind doesn’t mean that one must be a slave to one’s original plan. Often circumstances will either come up or come to light having been present all along, that make sticking to the original plan a folly. Of course we must see to our plans with the flexibility to adjust to unforeseen circumstances. But if we didn’t have a solid plan that was focused on the desired results from the beginning, chances are we wasted time, energy and other resources. The key, then is to make the best plan you can, but be ready to change if it makes sense to do so. I can’t tell you how many times in my life, this Habit was served me well. It will you, too. Those who don’t grasp, or don’t embrace this Habit, find themselves constantly spinning their wheels. I don’t know about you, but I just don’t think that I have the luxury of time to spend, spinning my wheels. If I’m going to fail in something because I set my sights too high, or because I didn’t count on every possible impediment from the start, then if I’ve begun with the end in mind it is much easier to adjust along the way. There’s an old cliché, if you fail to plan, you plan to fail and as with most clichés there is much truth in it. And Begin with the End in Mind is related. If we can visualise what the desired result would be, then we are in a better position to plan, and succeed. I retired from the US Air Force Chaplain Service (now, 'Chaplain Corps') in 2008, worked six years as a congregational rabbi and then two years' full-time Jewish outreach. I'm now (sort of) retired and working on a numbrer of 'out-of-the-box' rabbinic projects. I've just moved permanently to Israel, or 'made aliyah' as we say in Jewish circles.